Check Rates & Availability at Quality Inn & Suites! Get more for your money when you stay at our Quality Inn and Suites hotel in Mobile, AL. 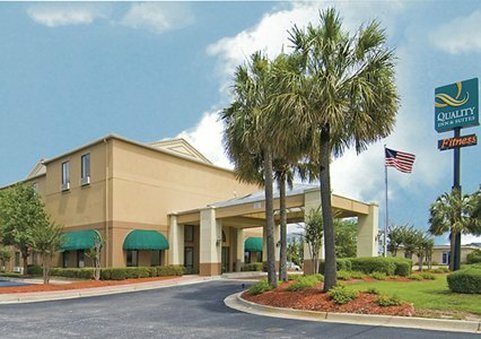 Our pet-friendly hotel is close to The Arthur R. Outlaw Mobile Convention Center, Robert Trent Jones Golf Trail, Mobile Museum of Art and the Mobile Civic Center. Each guest can enjoy our free breakfast, free WiFi, free coffee, free weekday newspaper and exercise room. Unwind in one of our guest rooms, all of which feature a coffee maker, microwave, refrigerator and wet bar. Sign up today for our Choice Privileges program and start earning rewards points with your next stay. *Some amenities may require an additional cost. Pets Welcome. Pet accommodation is 25.00 per stay with a maximum of two pets per room. This is a smoke-free hotel. 5 Rivers Delta Resource Ctr.